Apgar score is the test given to infants just after birth to test the condition whether he or she has breathing problem or not, what is the colour of the baby, about his or her heart beat etc. 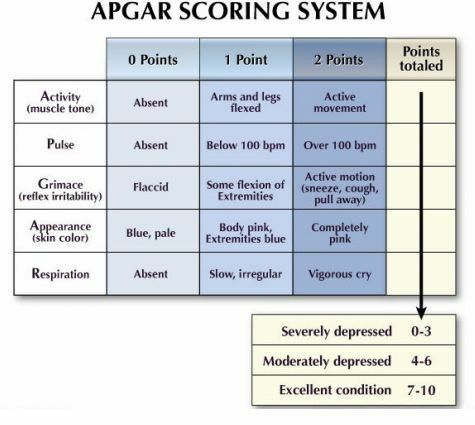 Let us study more about Apgar score, who invented it, what does Apgar stands for, it has any limitation or not etc. through this article. The Apgar score is a system used by the doctors to assess newborn baby's health at birth i.e. it is a measure of a baby's condition after birth. This test is used to check baby's heart rate, muscle tone and other signs to see if extra medical care or emergency care is needed. Do you know this test is given twice to the baby: once at 1 minute after the birth and again at 5 minutes after the birth. It also depends upon the condition of the baby, if required this test can be given again. In this test five things are used to check's baby's health. Each characteristic is rated from 0 to 2, with 2 being the best score. The total gives an Apgar score out of 10 for the baby. What is the meaning of Apgar score? If the Apgar score is 7 or more than it is considered as normal. At 1 minute if the score is 6 or less and at 5 minutes if the score is 7 or more than also baby is considered as normal after birth. But, if in the second test that is at 5 minutes and the score of the baby is below 7 then it is considered as low. If the baby score was less in the first Apgar test and after providing the treatment, in the second Apgar test that is at 5 minutes, score of the baby did not improved then doctors will closely monitor the baby and continue with the medical care. Dr. Virginia Apgar in 1952 devised a scoring system known as Apgar score to find out the health condition of a new born infant at 1 minute of age and if needed treatment then it should be provided for proper breathing or so. The Apgar score quantitates clinical signs of neonatal depression such as cyanosis or pallor, bradycardia, depressed reflex response to stimulation, hypotonia, and apnea or gasping respirations. Basically, the score of infant baby after the birth is reported at 1 minute and 5 minutes and at 5 minutes interval thereafter until 20 minutes with a score less than 7. This test is also used to predict individual adverse neurological outcome with other 5 characteristics as mentioned above. According to the Neonatal Encephalopathy and Neurologic Outcome, Second Edition, published in 2014 by the College in collaboration with the AAP, defines a 5-minute Apgar score of 7–10 as reassuring, a score of 4–6 as moderately abnormal, and a score of 0–3 as low in the term infant and late-preterm infant. That document considers an Apgar score of 0–3 at 5 minutes or more as a nonspecific sign of illness, which “may be one of the first indications of encephalopathy”. However, a persistently low Apgar score alone is not a specific indicator for intrapartum compromise. Is there any limitation of Apgar score? Basically the Apgar score tell the physiological condition of the infant but there are certain factors which influence the Apgar score like maternal sedation or anesthesia, congenital malformations, gestational age, trauma, and interobserver variability. With the variations in normal transition the score may be affected like lower initial oxygen saturations in the first few minutes need not prompt immediate supplemental oxygen administration. Also, because of immaturity the healthy preterm infant with no evidence of asphyxia may receive a low score. The low Apgar score is inversely proportional to birth weight and it cannot predict morbidity or mortality for any individual infant. To diagnose asphyxia, Apgar score alone is inappropriate. Therefore, we can say that the Apgar score is a test given to newborns soon after the birth to describe the condition of the infant. It provides a method to record fetal-to-neonatal transition. But this score does not predict individual mortality or adverse neurological outcome. Also, it is founded that Apgar score less than 5 at 5 minutes and 10 minutes confer an increased relative risk of cerebral palsy. As, Apgar score is affected by many factors so, if at 5 minutes it is 7 or greater then peripartum hypoxia–ischemia caused neonatal encephalopathy. Next Story What is the Siachen Glacier Dispute? Why is India Constructing Strategic Petroleum Reserves?